And for @Lephenixnoir debug mode is now false by default and a "Debug On/Off" button is hidden ... because I always forget to set debug mode to false before uploading to the public website.... (and Firefox is much much slower when debug mode is On). For information, this debug mode is just console.logging a lot of debug messages. A speed adjust button is hidden on the right of the "STOP !" button . This is a very useful feature! Ah yes, I had noticed about these logs (I even used them once), I was wondering about the performance too. A rough estimate would be a few ms for each operation. This is quite fast, well done! Ha ha, didn't spot this one! Using people's tricks against themselves. Call it C.Basic emulation ! Is it possible to set the timeout to zero? What happens if set the timeout to zero? 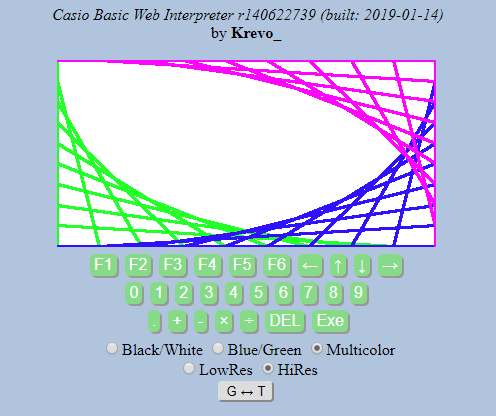 Also C.Basic may be an emulation of Basic Casio especially with 90+E. It's not just an emulation, it's a huge upgrade! Perhaps it's not an emulation but a simulation. I've uploaded a modified version where you will be able to choose 0ms as 'timeout' value. Nothing really special happens, It seems to be a little bit faster than "1 ms" timeout. But I should do some more precise calculations. Don't forget that this feature of adjusting speed is experimental. ATTENTION : les programmes qui utilisent Text() doivent être executés en basse résolution. D'ailleurs je pense rajouter des directives/pragma pour forcer tel ou tel mode. I understood a little that Java's time management is not easy. I try "Maze generator" with real calculator. The drawing result seems to be a little different. How is Range different from ViewWindow? I tried to, some times ago. It means my interpreter is not exactly like real hardware on this point (Plot/Line). And 'Range' is exactly the same as 'ViewWindow' (but for very old calc). I generate the same opcode for these 2 instructions. Thanks for testing. Anything said here helps me to make progress. I also understood that Range is the same as ViewWindow. So,I changed to F-Line and it works well. When changing ViewWindow to the following value, it was able to draw the full screen. This is the conversion formula used in C.Basic. from screen to ViewWindow coordinates. from ViewWindow to screen coordinates. for 90+E, 126 and 62 are tripled to 378 and 186. Bon, je poursuis .... j'ai encore beaucoup de choses à faire dont certains trucs qui nécessitent un peu de temps. I'm happy to implemented For/Next as it is used frequently. Maze Generator works the same with Basic Casio. It seems that the execution speed of the loop is little slow at default. However it is no problem as speed adjustment can be used. @Santaro21: Thanks for your encouragements. I've changed the default from 10ms to 15ms, thus making it a little slower by default... done that because, it should look like real hardware by default (and I know that you have the speed adjust button to do what you want/need). For/Next loops : it could have been implemented earlier but I wanted to solve the fact that Do/LpWhile and While/WhileEnd loops were too fast (because not using the timer) and were not Breakable. Sure It was easy to implement at first, but now I've a second (more complex) implementation that I use for all kind of loops (For/Next, Do/LpWhile and While/WhileEnd). And YES it was something really missing. I currently try to open existing programs and determine what is used frequently and what is missing. Sure, I've done nice progress since this november, 3 months ago, ... but I've got so much to do .... don't know if it will take months or years. I installed it on my Chrome. I also want to see the execution of perfect no-wait. Almost of the game program uploaded here did not worked. keeping compatibility is very difficult. About 4 years lator now, the number of game programs that can be played has increased. I'm pleased if there is something I can help you with the development experience so far. - légère retouche sur boucle For, For 1->A To 187 Step 5 ne s'arrêtait pas (ça faisait 1, 6, .... 186, 191, .... et le le but de 187 n'était jamais atteint mais dépassé) ... alors qu'en vrai ça s'arrête quand la valeur est dépassée. - (presque fini) Ajout de ce que j'appelle les sketchMode : SketchNormal, SketchThick, SketchBroken, SketchDot, SketchThin devant les commandes graphiques + S-L-Normal, S-L-Dot, .... à l'occasion modif du programme d'exemple "Lines" pour dessiner des lignes avec un style choisi au hasard. Ajout également d'un programme "Football Pitch" fortement inspiré de "IMG'FOOT", programme qui dessine le terrain de foot de Fifaa19 de Manolo, merci à lui. I'm happy to see steady progress. If Mat andDrawStat can be added, Tetris seems to work. In C.Basic a problem was found that the image generated by Fifaa 19 can not be used in the main program. I will fix it now. Bon, ça suffit la pause ... faut que je reprenne les devs là.